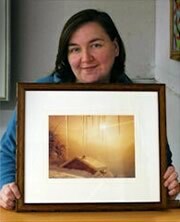 It all started in 2008 when my husband and I attended a weekend Introduction to Picture Framing course in Cambridge. We were all surprised when It turned out I was quite good at it. I started of by framing our own photographs & artwork. Then a friend asked me to frame some of the artwork she had collected. We both attended further courses to expand our knowledge. When my husband was relocated to Scotland in 2010, we decided it would be a good time to start up the picture framing business fulltime. We were lucky to find the ideal new home with a suitable outbuilding for the business. I joined the Fine Art Trade Guild in February 2010 and took my Guild Commended Framer (GCF) exam later that year. The standard for this exam is extremely high, I was pleased to achieve 97% in the paper section of the exam. I can frame almost anything that fits in a frame. I especially enjoy working with fabrics and relish the challenge of framing 3 dimensional objects such as flowers, sports shirts and even barbershop paraphernalia. One of my newest services is 'Memory in a Frame' which consists of a collage of related items such as certificates, badges, medals, newspaper clippings etc. I appreciate that it’s not always possible for people to visit my workshop in Kinlocheil, so I offer a home visit service to anyone within the Lochaber area. This allows me to view the location the frame will be placed and provide additional suggestions. To see more of my work visit the penguin corner. "Gillian always provides framing services with a smile and shows fantastic knowledge. Nothing seems to be too much trouble."